Madame Alexander's Storyland dolls continue to become life-long friends to generations of children, as well as adults. 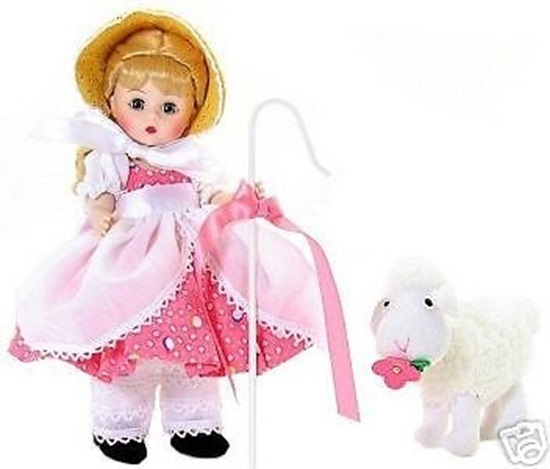 "Little Bo Peep" is wearing a pretty pink print dress with white puff sleeves trimmed with white Venice lace and a bonnet tied with a big satin bow. A white pannier, also trimmed with white Venice lace, enhanches her dress. Frilly pantaloons, matching petticoat, white socks and black suede Mary Janes complete her Storybook look. She comes with a white staff trimmed with pink bow and an adorable plush lamb with a flower in it's mouth. "Little Bo Peep" is perfect for ages 14 and up.